Fast and dependable, beans (Phaseolus vulgaris) are among the most popular crops grown in gardens. Over 85 percent of our Garden Planner users grow beans, which come in a huge array of types and colours. Trying them all will keep you busy for years, especially if you grow both snap beans and shelling types. French beans (also called green beans) are picked when the pods are young and tender. Depending on variety, they may be green, yellow, or purple. Today’s pickings from my garden (above, left to right) include Yellow Wax climbing beans, Purple Peacock climbing beans, Slenderette dwarf bean, Purple Queen dwarf bean, and Golden Roc d’Or dwarf bean. The purple colour of any French bean fades when the beans are cooked, which makes them a convenient "blanching indicator" if you are freezing a bumper crop. Surprisingly, yellow snap beans (often called wax beans) contain as much Vitamin C as their green counterparts, so there is no nutritional trade-off to growing a beautiful rainbow of French beans. 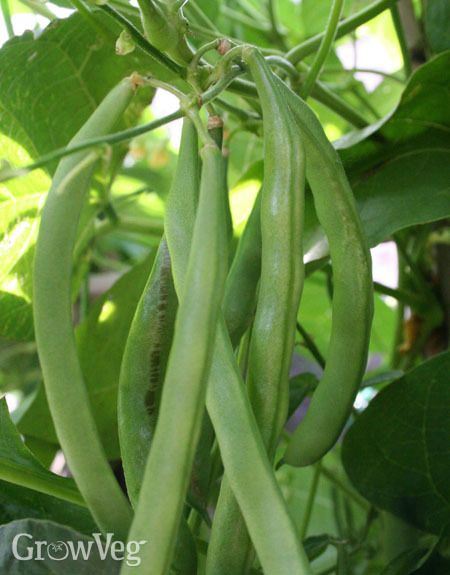 French beans can grow as compact dwarf beans or as long, twining climbing beans. In terms of garden efficiency, I think it’s best to use fast-growing dwarf varieties when you want slender filet beans or a heavy all-at-once crop for freezing. Climbing varieties often produce bigger, meatier pods over a longer period, so they are a great choice for fresh eating. Why not grow both? To keep either type of French bean productive for a long time, use two hands when harvesting to keep from accidentally breaking off branches. Pick your beans only when the leaves are dry, because it’s easy to spread disease when the leaves are wet. Harvest French beans every other day to get them at their best. Should some of your beans become tough, lumpy, and hopelessly overripe, try leaving them on the plants until the pods fade to tan. Then you can harvest the beans inside, as if they were shelling beans. In America, the Seed Savers Exchange has started calling these varieties eating beans, I suppose because you eat the beans rather than the pods. Soup beans for drying fall into this category, but as a gardener I prefer to use to my precious growing space for "green shelling beans" – varieties that are harvested just as the pods begin to dry, but before the beans lose their glossy plumpness. The best all-round choice is commonly called October bean, perhaps because the variety name is so long: Taylor’s Dwarf Horticultural Long Pod. For weeks these guys look like very vigorous French beans, and you can eat the young, tender pods as French beans if you like. But if you leave the plants alone, the pods will fill with beans and develop a strong string (or pod suture) to keep the seeds safe. Then the pods develop artful pink stripes and blotches. When the background colour fades to creamy white, the beans are ready to harvest, shell, and cook for about 30 minutes. Another personal favourite, French flageolets (above), are handled the same way. Harvested just as the pods change from green to creamy beige, the fresh version of these slender lime-green beauties cannot be bought at any price. If you want to try them, you will have to grow them yourself. "Great artical. I grow rattle snake beans, black eye peas and limas. Will try some of these next year." "I harvested my bush green beans last year on June 26 (first harvest. This year, the plants look healthy but still only have the white flowers and little buds. No green beans sprouting yet. Time to panic, or can I trust that maybe they are yet to come?"